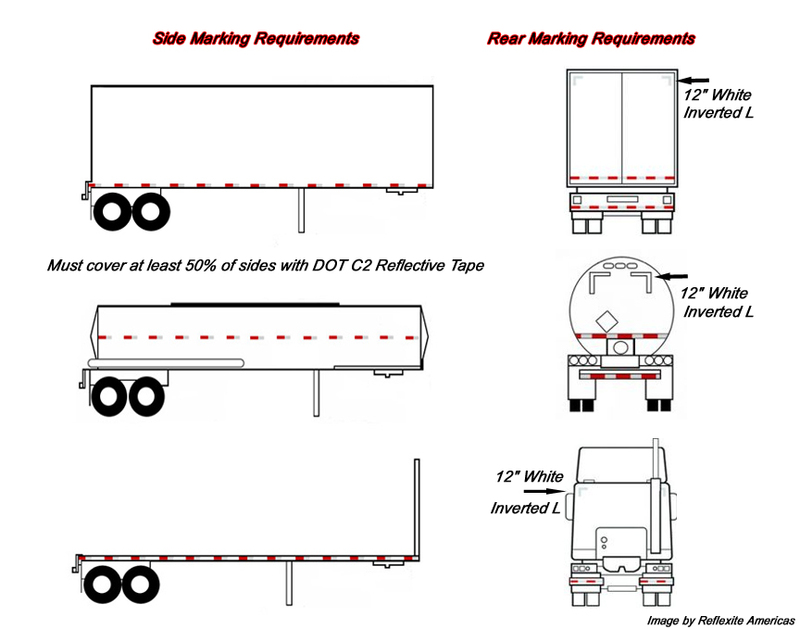 Introduction – Trucks exceeding 10,000 pounds and over 80 inches wide must mark their trailers with 2″ wide DOT C2 reflective tape that alternates white and red. (white looks silvery in the daytime). A 6/6 (6″ red and 6″ white) or a 7/11 (7″ white and 11″ red) pattern can be used. 50% of each side must be covered. (even distribution) In the rear, two strips must be used in the lower rear and an inverted L using solid white must mark the top corners of the trailer. Trucks must be marked in a similar fashion. See pictures at the bottom of this page. The FMCSA has set up regulations requiring the use of conspicuity (reflective tape) materials on trailers and the rear of truck tractors. The rules are in place to help reduce the incidence of motorists crashing into the rear or sides of tractor trailers at nighttime and under other conditions of reduced visibility. Also to reduce the incidence of motorists rear ending truck tractors (under operation without trailers) under the same types of conditions. The following is a description of where the conspicuity treatments need to be located on trailers. Images of conspicuity treatments on some common types of trailers are provided at the bottom of this page. The 2″ DOT C2 retro reflective sheeting need to be applied to both sides of the trailer or semitrailer. Each strip of retro reflective sheeting must be positioned as horizontally as practicable, beginning and ending as close to the front and rear as practicable. The conspicuity treatment is not required to be continuous. However, the sum of the length of all of the segments must be at least half of the length of the trailer and the spaces between the segments of the strip must be distributed as evenly as practicable. The centerline for each strip of retroreflective sheeting (or reflex reflector) must be between 375 mm (15 inches) and 1,525 mm (60 inches) above the road surface when measured with the trailer empty or unladen, or as close as practicable to this area. If necessary to clear rivet heads or other similar obstructions, 50 mm (2 inches) wide retro reflective sheeting may be separated into two 25 mm (1 inch) wide strips of the same length and color, separated by a space of not more than 25 mm (1 inch). The rear of each trailer and semitrailer must be equipped with retro reflective sheeting (or reflex reflectors). Each strip of retro reflective sheeting (or reflex reflector) must be positioned as horizontally as practicable, extending across the full width of the trailer, beginning and ending as close to the extreme edges as practicable. The centerline for each of the strips of retro reflective sheeting (or each reflex reflector) must be between 375 mm (15 inches) and 1,525 mm (60 inches) above the road surface when measured with the trailer empty or unladen, or as close as practicable to this area. Two pairs of white strips of retro reflective sheeting (or reflex reflectors), each pair consisting of strips 300 mm (12 inches) long, must be positioned horizontally and vertically on the right and left upper corners of the rear of the body of each trailer and semitrailer, as close as practicable to the top of the trailer and as far apart as practicable. If the perimeter of the body, as viewed from the rear, is not square or rectangular, the conspicuity treatments may be applied along the perimeter, as close as practicable to the uppermost and outermost areas of the rear of the body on the left and right sides. On August 8, 1996, the NHTSA published a final rule requiring that truck tractors manufactured on or after July 1, 1997, be equipped with red-and-white retroreflective material similar to that required on the rear of the trailers they tow to increase nighttime conspicuity. Manufacturers may choose either retroreflective sheeting or reflex reflectors. In the case of truck tractors delivered with a temporary mudflap arrangement rather than permanent equipment, the requirement for retroreflective material near the top of the mudflap may be satisfied with material carried by the temporary mudflap brackets that are transferable to the permanent mudflap system. Retroreflective material is also required near the top of the cab in a pattern similar to that used on trailers. Previous PostHow Does Retro Reflective Tape Work ?Next PostWhat is the Difference Between Glass Bead and Prismatic Reflective Tape?